The massive bill passed into law in the aftermath of the Parkland shooting contained a slew of highly contentious proposals that divided Florida's moderate Republicans from the staunchest Second Amendment buffs on the right and Democrats seeking tighter gun control on the left. But another mandate of the new law received much less attention during the final weeks of the 2018 legislative session, yet it got presidential praise yesterday. The "FortifyFL" app was unveiled by Florida Attorney General Pam Bondi, who said the app will allow students and members of the public to anonymously report "suspicious activity." That includes any "information concerning unsafe, potentially harmful, dangerous, violent, or criminal activities, or the threat of these activities," according to a press release from her office. That information will then be forwarded to police and school officials. President Trump, who was with Bondi at an International Association of Chiefs of Police event in Orlando on Monday, tweeted about the app. Bondi held a press conference about the new app at a hotel in Orlando, across the street from the Orlando Convention Center where she was with Trump shortly before. The press release also credited Bondi with getting the language that created the app into the new law. "After Parkland, I made it my mission to ensure that when students provide information that could potentially save lives, there would be a centralized tool they could use to quickly send that information to the right authorities," Bondi said in the statement. The app, which was available for download on Monday afternoon, will be monitored by both the Florida Department of Law Enforcement "in collaboration" with the Attorney General's office and the Department of Education, according to law. Mariana "Marili" Cancio has long been a supporter of local anti-violence groups, financially funding hotel rooms and T-shirts while successfully advocating for a witness protection law last year. 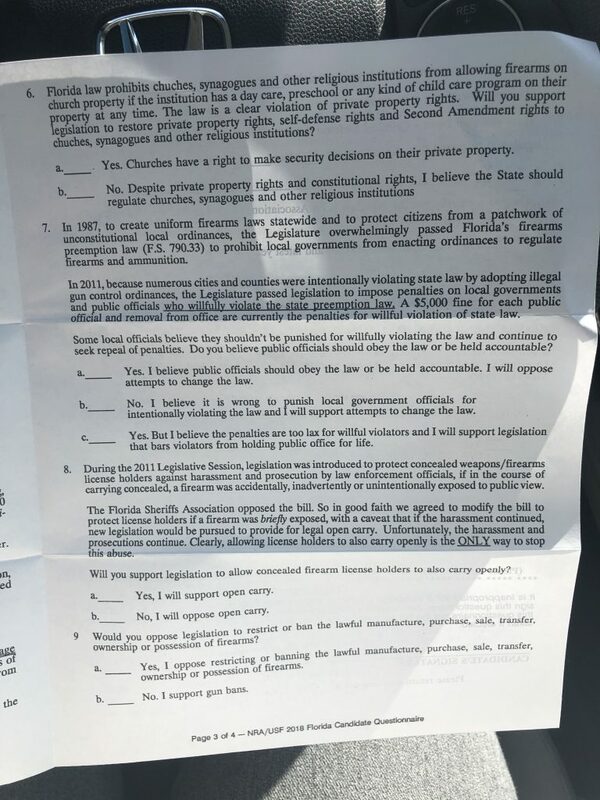 The Republican candidate for the Florida Senate District 40 race touted that work on a recent mailer. On one side, she posed with Tangela Sears, the founder of Miami Dade Parents of Murdered Kids, a support group Sears began after her own son was killed in 2015. On the other side, the mailer said Cancio's efforts were recognized by Sears' organization and the Trayvon Martin Foundation. But the foundation's namesake, who was from Miami and became the face of the #BlackLivesMatter campaign when his murder was publicized in 2012, was misspelled on the mailer. Trayvon was spelled with an "e."
"That's definitely not the spelling," said Kat Tynes, spokeswoman for the Trayvon Martin Foundation based out of Florida Memorial University in Miami Gardens. "it just takes a few seconds to do some research just to make sure the research is accurate." When first asked about the typo by the Miami Herald, Cancio said, "There's been a lot of mailers." Cancio sent the Miami Herald a photo of a plaque from the Miami Dade Parents of Murdered Kids and the Trayvon Martin Foundation, dated May 2016, recognizing Cancio for her "support, commitment and dedication on our journey to justice." "I'm proud of the work I've done for this community." she said. Tynes said Cancio was recognized at a joint event hosted by Sears and her organization, but that the Trayvon Martin Foundation has not "directly" honored Cancio. 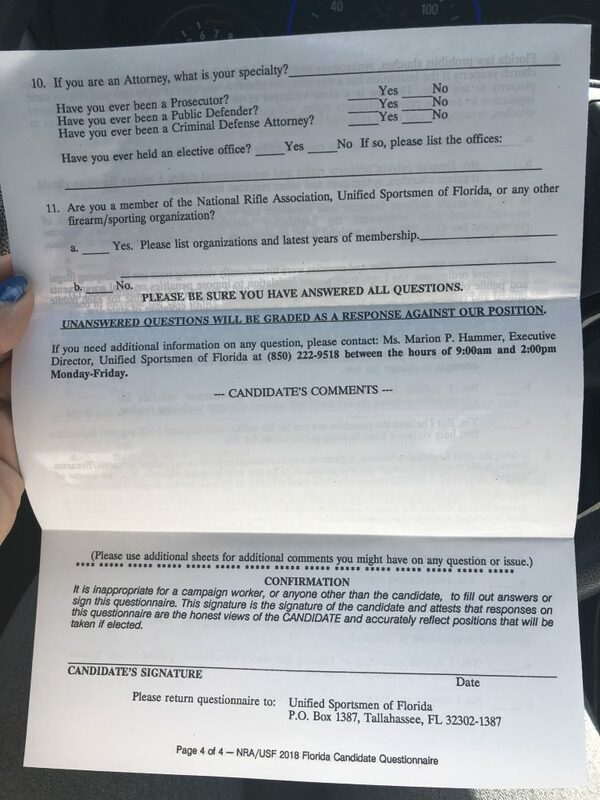 But Sears says Cancio should not use her organization or the Trayvon Martin Foundation on the campaign trail and has asked Cancio's campaign to cease mentioning those groups. "It's misspelled and it shouldn't have been there," Sears said, adding, "I don't mix our dead kids work up with politics. I support her and I'm willing to advise her without parading groups of dead kids." Cancio gave no further comment. Cancio is running against Democratic candidate Annette Taddeo, who won the Southwest Miami-Dade seat in the 2017 special election. Parkland activist David Hogg appeared on MSNBC’s “Morning Joe” Thursday to announce a partnership with dozens of mayors across the country to register young voters in high school and college ahead of the general elections in November. Hogg, a crusader for stricter gun laws following the Feb. 14 shooting at Marjory Stoneman Douglas High School, was joined Thursday by New York City Mayor Bill de Blasio. The alumnus of Marjory Stoneman Douglas High School, where 17 students and educators died during the Valentine's Day shooting, said dozens of U.S. mayors — including a handful in South Florida — would pledge to make resources available for a community-wide voter registration to take place Sept. 25, which will coincide with the Sept. 25 National Voter Registration Day. As part of the so-called Mayors for Our Lives effort, named after the March for Our Lives movement against gun violence, city leaders from Parkland to Los Angeles have agreed to dedicate resources to a community-wide voter registration day on high school and college campuses within their respective cities. In Florida, the final day to register to vote in the general election is Oct. 9. During his TV spot, Hogg said young voters were critical to the victory of Tallahassee Mayor Andrew Gillum in the Democratic primary for governor of Florida — and that poll numbers don’t take recently registered voters into account. NextGen America, a political action committee formed by billionaire hedge fund manager Tom Steyer, said voter turnout in college-area precincts jumped during Tuesday's primary. In Alachua County, home to the University of Florida, turnout was up 10 percent, according to the PAC, which backed Gillum financially. Precincts in Tallahassee that skew younger saw five times more votes cast Tuesday compared to 2014's primary election. 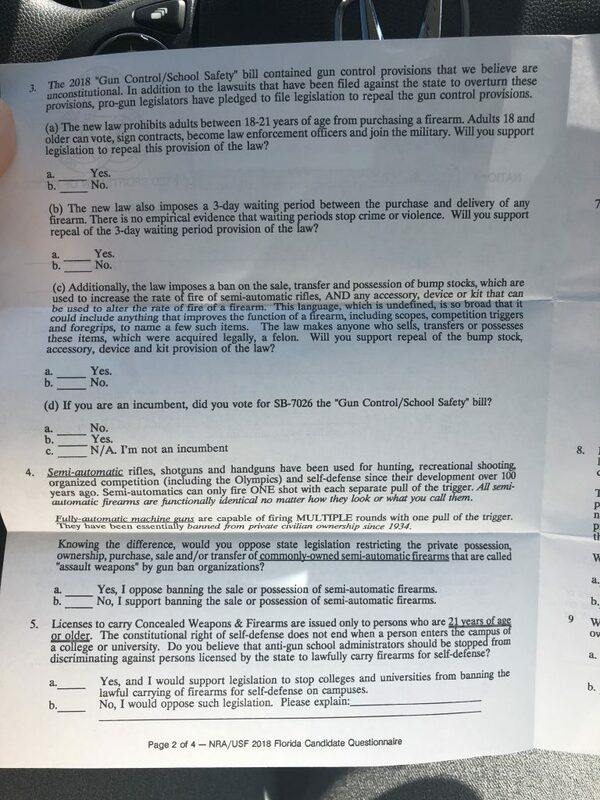 Youth voter registration in Florida rose by 41 percent following the shooting in Parkland, according to an analysis by TargetSmart, a data firm that works on behalf of Democrats. In Florida, the mayors of Parkland, North Miami, Pembroke Pines and Miami Gardens have pledged to help register young voters through the Mayors for Our Lives effort. 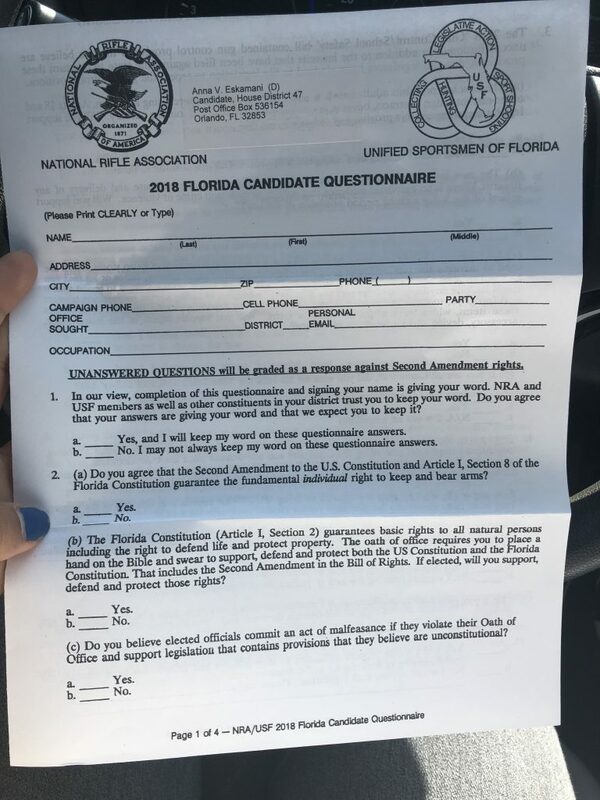 Hunschofsky, who said her city saw a two-to-threefold increase in overall voter turnout compared to the last midterm primaries, said the city commission would present some of the members of March for Our Lives with a city proclamation designating Sept. 25 as National Voter Registration Day in Parkland. She said the Broward County Supervisor of Elections would work with schools across the county to make resources available during the registration drive. Airboat operators carrying passengers on their boats will soon have more stringent requirements to pilot their vessels, after a deadly crash that killed a University of Miami graduate last year. The Florida Fish and Wildlife Conservation Commission approved new course requirements Tuesday, following the passage of a law that directed the agency to set new regulations for commercial airboat operators earlier this year. The legislation, named for 22-year-old victim Ellie Goldenberg, requires airboat operators to complete a more comprehensive training course and pass an exam to pilot the powerful boats, which are popular with tourists in the Everglades. In the last several years, commercial airboat tours have had little official oversight, with no required licenses for operators or specific safety classes. Though airboat operators are currently required to complete a general eight-hour boating safety course, no background checks are required and no education specific to airboating is mandated. The flat-bottomed boats, propelled by powerful airplane-like engines, do need to be registered with the FWC and have basic features like a muffler for the engine’s sound. But insurance is often not required and airboat operators have been otherwise unregulated. A Miami New Times analysis found more than 75 accidents involving private and commercial airboats in the last three years, with at least seven deaths and more than 100 injuries. The rule approved by the Fish and Wildlife Commission Tuesday will require operators to be certified in CPR and first aid, subject to a fine. Anyone operating an airboat with passengers must also take a course with at least 24 hours of instruction, including 8 hours of classroom time and 14 hours on the water. Courses will be required to cover several topics, including state and federal boating requirements, navigation rules, environmental concerns, ecosystem awareness and the causes and prevention of airboat accidents. Airboat operators will also have to pass a final exam of at least 50 questions, and course instructors will have their own standards too: at least 120 hours of experience operating an airboat in the last three years and no felony convictions in the last five years. The law behind the new rules was approved during this year's legislative session after Goldenberg, a recent theater graduate at the University of Miami, was killed during an Everglades airboat tour last May. The 22-year-old died the day after she received her diploma when, during the tour her family took to celebrate, the craft flipped over and trapped her underneath. The other passengers on the boat and the operator survived. The rules will go into effect by Jul. 1, 2019. "A misdemeanor means nothing — it's not even a slap on the wrist," he said. He said he also intends to advocate for a law punishing drug use among operators: "Just because there's no marijuana law in Florida yet is not a good enough reason," he said. Gagne "walked off scot free and he killed my daughter." Now that private-school scholarships for bullied Florida students are a reality, public school district leaders want to know exactly who will qualify for the available funds. They made clear Wednesday their concerns that the program could be ripe for abuse by families more interested in getting vouchers than in protecting children who really were victimized. "The way the statute reads, we would have to make the scholarship [notification] available even if the allegations were not merited," Santa Rosa County assistant superintendent Bill Emerson said during an hour-long rule-making conference call. "What we're asking is if we've interpreted that correctly." State Department of Education officials couldn't disagree. Adam Miller, executive director of the Office of Independent Education and Parental Choice, responded to Emerson by reading from the law, which was included in HB 7055 passed in the spring. It reads, in relevant part, "a student enrolled in a Florida public school in kindergarten through grade 12 is eligible for a scholarship under this program if the student reported an incident" listed in the law. Those include bullying, fighting, sexual harassment and several other offenses. "Upon conclusion of the investigation or within 15 days after the incident was reported, whichever occurs first, the school district shall notify the parent of the program and offer the parent an opportunity to enroll his or her student in another public school that has capacity or to request and receive a scholarship to attend an eligible private school, subject to available funding." What if two students were equally involved in a fight and neither reported it? Would the district have to inform families of the scholarship program, asked St. Johns County government relations liaison Beth Sweeny. Not if the student doesn't initiate a report, Miller said. But what if both students report being involved in a fight or another of the listed offenses? "Then the notification would go to both," Miller answered. This scenario has been a driving concern of the scholarship critics, who pointed out that the law as written does not prevent someone from creating a situation simply to get a state-supported private school scholarship. A May 30 report from the PreK-12 Education Impact Conference estimated that 7,302 Hope Scholarships will be awarded to students in the 2018-2019 school year, with the most going to kids in sixth through eighth grades because of the bullying rates in those groups. The report estimates that $27 million will be collected for the pilot year, which will come from people who elect to have the sales tax from a car purchase directed toward the Hope Scholarship fund, per the new law. That money is expected to be available to start being distributed to students in late 2018. The Senate attempted to rewrite the bill to offer scholarships to students with "substantiated" incidents, but the House did not agree. Proponents questioned why a family would disrupt its school life unless the children had true safety problems. The bill sponsors repeatedly said their goal was to give victims a way out. They did leave the door open for less egregious incidents to qualify. "The reasonable parent is not going to say, 'Oh my gosh, I have to move my child,' because of a minor random incident," sponsor Rep. Byron Donalds said in November, when presenting the measure in committee. "Would they still be afforded the information? Yes they would." Emerson said the districts were asking the Department of Education to consider tightening up that aspect within the rule. Miller said that couldn't happen. "We don't have the ability to revise what is explicitly provided for in the law," Miller said. The department will continue to take comments on the proposed rule on its website until the State Board of Education votes on it. That vote is tentatively set for July 18. This report was written by Tampa By Times reporter Jeffrey Solochek and Tallahassee bureau reporter Emily L. Mahoney contributed. The NRA is asking politicians, Will you repeal parts of this year's school safety bill? Florida's check-cashing industry has been notorious for allowing criminals to commit money laundering, workers-compensation fraud and tax refund schemes. So when state lawmakers in 2013 passed a law requiring licensed check-cashers to report, in real time, the people and checks passing through their doors, law enforcement called it a big step in the right direction. Florida is believed to be the only state with a database like it. But the nation's largest retailer is displeased. For the last year, Walmart has been pushing to be able to cash bigger checks without participating in the database, arguing that its own anti-fraud programs are a "highly effective" substitute. The company asked for a temporary waiver last year so it could cash bigger FEMA assistance checks in the wake of Hurricane Irma. And in this year's legislative session, it pushed for a bill that would have effectively gutted the state's database, rendering it nearly useless. Walmart believes that Florida's unique restrictions are too onerous, and it wants to change them so it can serve more customers. "For us, this issue is not about fraud, it’s about serving our customer’s needs," Walmart spokeswoman Monesia Brown said in a statement. "We think the current limit in Florida is outdated and our customers agree." The issue received little attention during session. Walmart's bill quickly died after the state's Office of Financial Regulation, which manages the database, came out strongly against it. But it received attention last week, after Politico reported that Walmart went above OFR's head in the middle of the Legislative session, appealing to state CFO Jimmy Patronis on the bill. Last week, the head of OFR announced he was resigning, under pressure from Patronis. State Sen. Jeff Brandes, R-St. Petersburg, who sponsored the bill, said that with the current head of OFR leaving, Walmart could be effective avoiding the state regulators. "I think the new head of OFR, having a different perspective, could pave a new path forward," Brandes said. The state's financial regulators had serious concerns about this year's bill, however. Businesses that specialize in cashing checks have to be licensed by the state, record the IDs and thumbprints of customers cashing checks larger than $1,000, and send the information into the database. But large companies that don't specialize in check-cashing, like Walmart, are allowed to cash checks of up to $2,000 per person per day without recording any information about the customer. Information about the checks and who cashes them also does not go into the state's database. It's a loophole that Walmart wants to expand, so that it can cash up to $7,500 in checks per person per day without the state's safeguards. State regulators fear that would be disastrous. Since 94 percent of all checks in the state's database are less than $7,500, the vast majority of criminals could simply go to to Walmart to cash their checks without scrutiny. "The amount of data and the usefulness of the CCDB [check-cashing database] would be substantially reduced, and its fraud-detection abilities would be virtually eliminated," one OFR document states. "The potential impacts of Senate Bill 1126 are cause for great concern." For decades, law enforcement and businesspeople fought to get the state to crack down on the industry. Two statewide grand juries and a state task force all recommended greater scrutiny of check-cashing stores, which they called in 2008 a "shadow banking industry" responsible for laundering hundreds of millions of dollars each year in the state. The new database, rolled out in 2015, allows state regulators to see in real time who is cashing checks and where. Before, regulators had to rely on the store's own electronic logs, and they weren't able to track criminals who jumped from store to store to pass fraudulent checks. The database is used by the IRS' Miami and Tampa offices and by police around the state, and officials chalk up some arrests to the new system. But Walmart believes its own security justifies increasing the limit to $7,500. "While we understand the intent of the state’s limit - the risk of fraudulent checks - we believe our advanced in-store technologies, expert investigators and asset protection associates are highly effective in deterring, identifying and researching fraudulent activity," Brown, the company spokeswoman said. The company's lobbyist, Jeff Johnston, said that Walmart wants to serve a population that doesn't have bank accounts, and that it did not want to hamper the state's anti-fraud efforts. "We never had any intentions to hurt the database, blow up the database," Johnston said. "From what we’ve been told, it’s doing very, very good things." He said the Walmart is not opposed to sharing some data with state regulators, but it has no interest in becoming a licensed check-casher. "There are no other states that have a database or would require us to do what Florida has asked," Johnston said. "We’re not designed that way." For Brandes and the House sponsor of the bill, Rep. Lawrence McClure, R-Dover, the issue is whether the restrictions hamper businesses from operating in the state. "We don’t want to do something that isn’t in the best interests of Florida’s business climate," McClure said.